Don't let UV damage and moisture damage the look of your Hi-Lo Trailer. Get the ADCO SFS AquaShed Hi-Lo Trailer Cover for the best All-Weather protection. Whether you're storing your trailer in the sun or snow, you can have peace of mind knowing your camper is shielded from the elements. Covering your RV shouldn't be a hassle, just something that you do to protect your investment. SFS Aquashed material by ADCO is designed to be lightweight and easy to put on your Hi-Lo travel trailer. Contoured to fit the curves of your RV and made from high performance polypropylene, this cover is especially good for use in windy or dusty climates. To measure the length of your unit, include your bumpers and spare tire, but exclude the hitch for a proper fit. 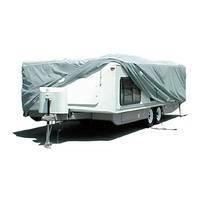 RV Covers Direct® stocks Hi-Lo Trailer covers—we are ready to ship them the same day that you place your order, Monday through Friday. Located in Chesnee, SC, RV Covers Direct® has over ten years of experience in protecting RVs with the best covers on the market. Whether you have recently purchased your RV, or you’ve been enjoying it for many years, allow us to help protect your investment.